During the journey on the GoldenPass MOB Panoramic, the Bernese Oberland with its rich tradition wonderfully blends with the Mediterranean atmosphere of the French-speaking Swiss region. Large panoramic windows allow travellers to experience up close the landscape so rich in variety – year-round. The GoldenPass MOB Panoramic truly lives up to its name: Gleaming golden, the Premium panoramic train moves from Zweisimmen in the Bernese Oberland towards Montreux, fashionable resort on the shores of Lake Geneva. The train belongs to the Montreux-Berner Oberland Railway (MOB). 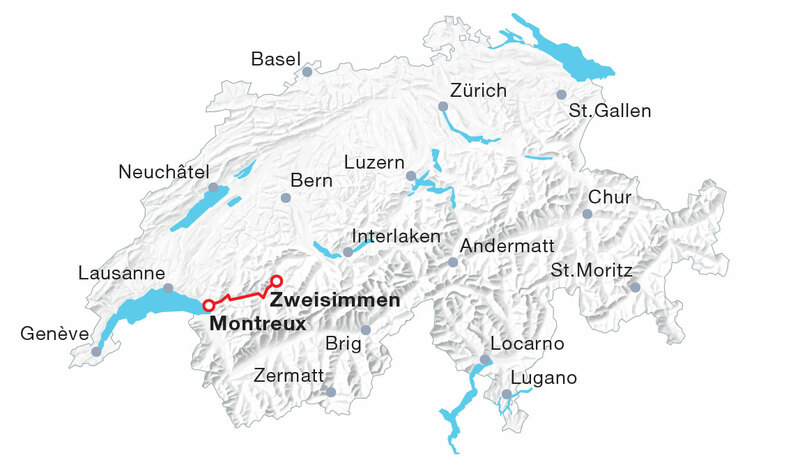 It forms the final part of the GoldenPass Line, which starts in Lucerne and leads to Zweisimmen via Interlaken. On the last stretch, the train winds its way down the hill and is greeted by real Mediterranean flair in Montreux. No catering service available on this train. This route is fully covered by the Swiss Travel Pass (Flex) and GA travel card. Seat reservation is recommended.